use Jewish Penicillin to treat colds in pregnancy. Jewish Penicillin, or chicken soup, has been proven to effectively treat cold symptoms without the risk of medication side effects. The Holocaust was particularly devastating for the Jewish population in the Czech Republic and especially Prague. A 1930 estimated placed the population of Jews at around 120,000. Of those only 17,000 survived the war. Many Jewish people were taken to concentration camps where they were executed; while others died from various illnesses and starvation. About 15,000 Jewish children from the Czech Republic were placed in a children’s camp. Only 93 of those children survived the war. 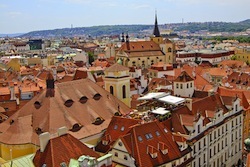 Emigration after World War II further dropped the number of Jews in the Czech Republic. Today the Jewish population hovers around 4,000. Place the chicken carcass in a large stock pot. Add all the vegetables and spices. Cover with enough water to reach one inch above the ingredients. More water may be needed as cooking goes on. Turn the pot on high and bring water to a boil. Reduce heat to a simmer and cover with a lid (leaving the lid just off the top). Cook for about one hour. Taste soup and season as needed. Remove chicken carcass and bones from the soup.